Returning from a fact finding trip to Africa in June of 1985, Ken Kragen was asked "It wonderful what you are doing for Africa but we have lots of people in need right here at home. What are you going to do for America?" 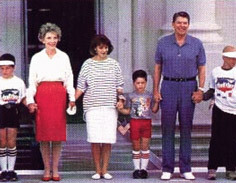 His response was "Hands Across America" the largest public demonstration ever created. It brought together more than 6 million people in a continuous hand holding line from New York to California for the purpose of raising money and awareness of the plight of the hungry and homeless in this country. The idea for "Hands Across America" was given to Ken Kragen by a PR executive working pro-bono on "We Are The World." He said "Don’t laugh but what if we put a continuous line of people together holding hands from the Pacific Ocean to the Atlantic?" Kragen responded, "I’m not laughing. In the years since Ken Kragen has often said, "It’s much easier to do the ‘impossible’ than the ordinary. You get people’s attention and support when you do something that makes them say, ‘Wow, I can’t believe you’re attempting that!’"
"Hands Across America" certainly had that ‘WOW’ factor. It brought together American’s of all races, religions and political persuasions in an unprecedented show of unity. It directly raised $34 million dollars to fight hunger and homeless in America and it resulted in at least a billion more from the US government and private organizations. Most importantly it opened the door for the media to report on the plight of these people. Something they rarely did until then.